Well, what a week this has been! We have been suffering through extra high temperatures and no rain at all for the last month. Then early last week Tropical Cyclone Oswald began tracking down the coast from north Queensland and dropping excessive amounts of rain on the way. By Thursday it hit us! 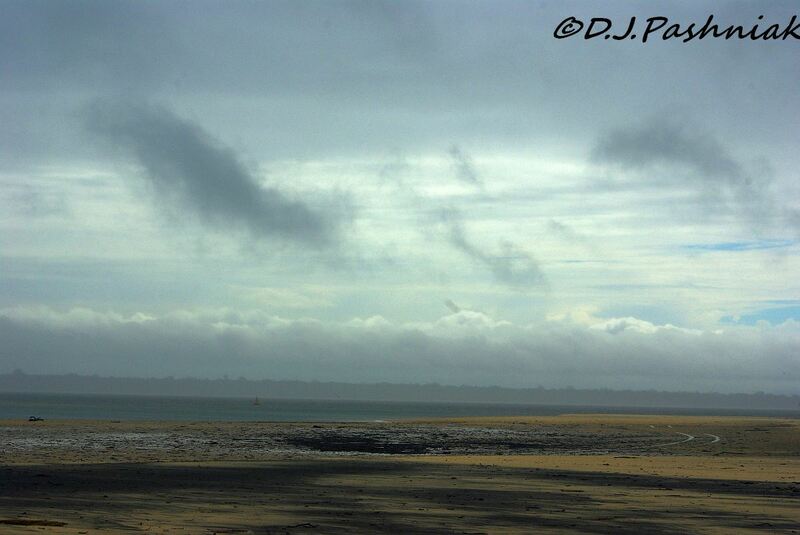 It was now classed as an ex-tropical cyclone but still had very high winds and lots of rain. Over four days we had 451mm (18 inches) of rain (measured in my own rain gauge). It was very uncomfortable but didn't do any great damage right at my place. By Sunday afternoon the rain had eased off to showers around here. However, all the rivers still had to carry off the rain that had been falling in the catchment areas. There are no big rivers or streams that come down close to here. We lost power for a few hours - we lost TV for several days - and worst of all we lost ALL phones (landlines and mobiles) for the last 24 hours. Everything is now back on and I hope it stays that way. The towns and cities on all the rivers have turned into disaster areas. Some of the catchment areas measured 1000mm of rain! The worst hit area is north of here - the city of Bundaberg. Flood waters have inundated the city to levels never seen before, and yesterday and today emergency services have been using helicopters to lift people off house roofs and anywhere else they have been caught. Even the hospital has had to evacuate all their patients by helicopter down to Brisbane. The storm tracked down almost as far as Sydney in New South Wales doing lots of damage especially on the north coast of NSW. I think I have been very fortunate! 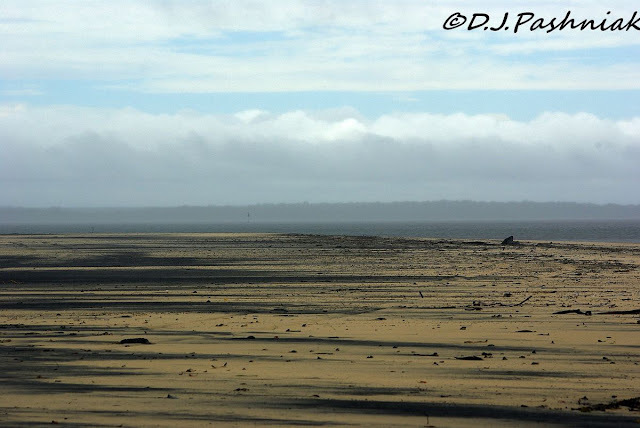 On Sunday afternoon, after the worst of the wind and rain had passed, I went out to Inskip peninsular with friends who have a big heavy 4 wheel drive. It was almost low tide and most of the peninsular was exposed. However, the shape of the sand spit and the wave marks on the sand were signs that the waves had been breaking right over this area a few hours before. Huddled down among the flotsam brought up by the tide was a Tern that I had never seen before. At first we thought it was injured or even dead but it was only resting and flew off as we approached. 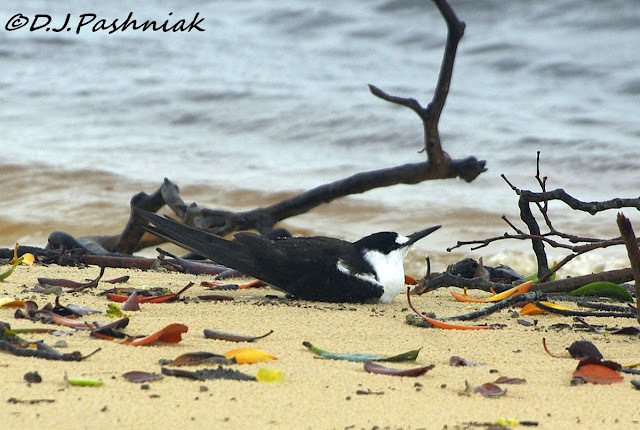 It was a Sooty Tern (Sterna fuscata) and had been brought down by the storm. 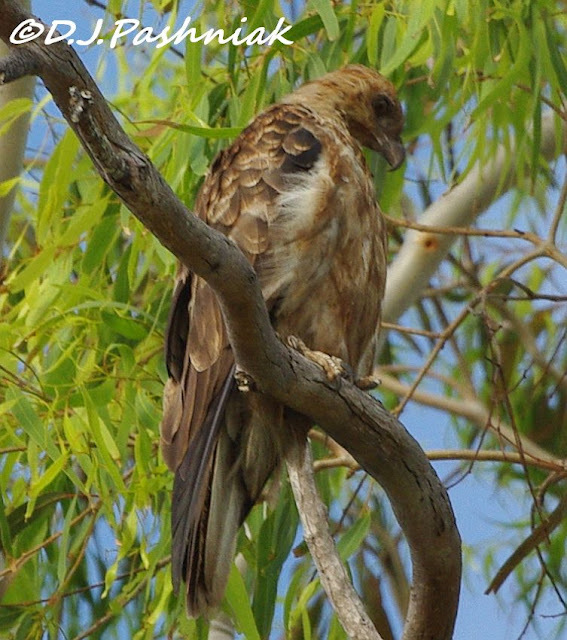 They are usually found from Cairns northward and around to West Australia. There was also a group of terns feeding off small fish a little way off from the shore. I had a friend (who is an expert on terns!) look at my photos and she counted 13 Sooty Terns feeding among the birds out there. 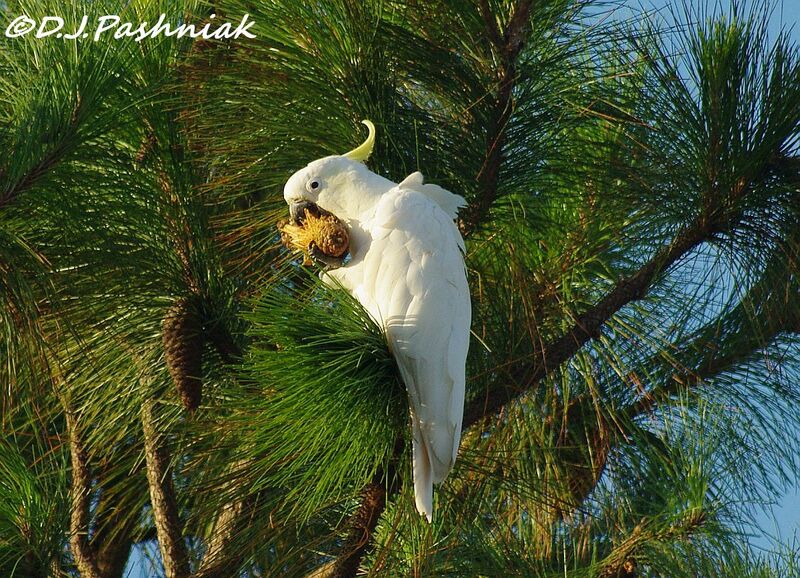 The following day this bird was handed in to a wildlife carer. 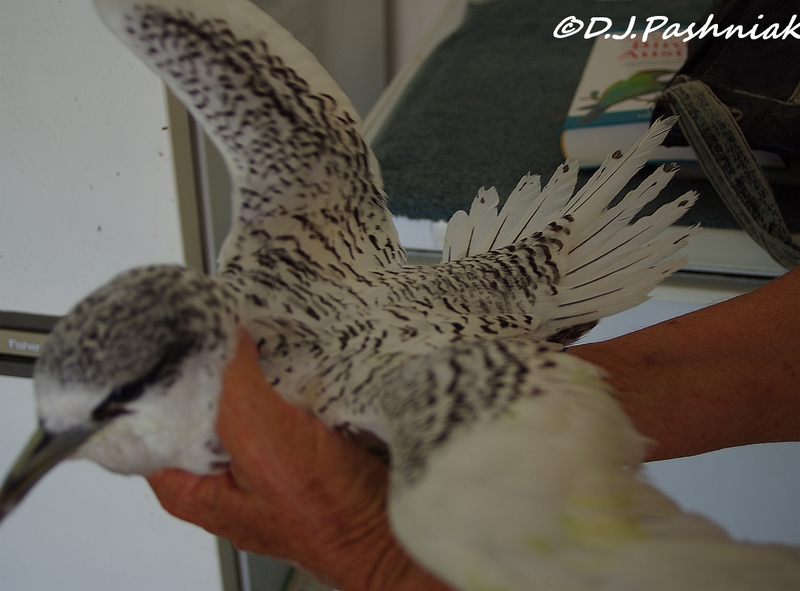 It is a juvenile Red-tailed Tropic Bird and had also been blown south on the big storm winds. This is NOT a perfect photo but is a very interesting record for this far south. 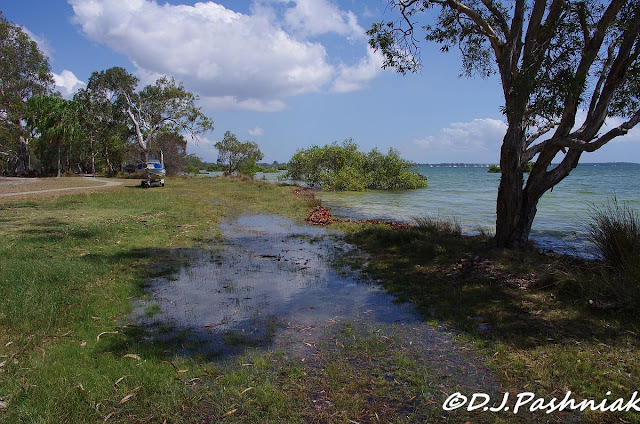 The king tide was this last week-end and there was certainly a lot of media attention with photos of the high tide eroding away beaches. Up in my area it was a non-event! 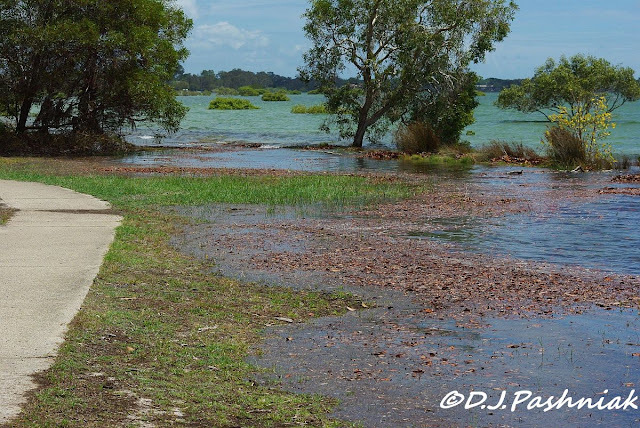 I was hoping for some spectacular photos of what rising water levels in the future might do to our life-style here on the coast - but - it just didn't happen! This photo was taken in 2009 when the tide height from the charts was 2.83 meters. 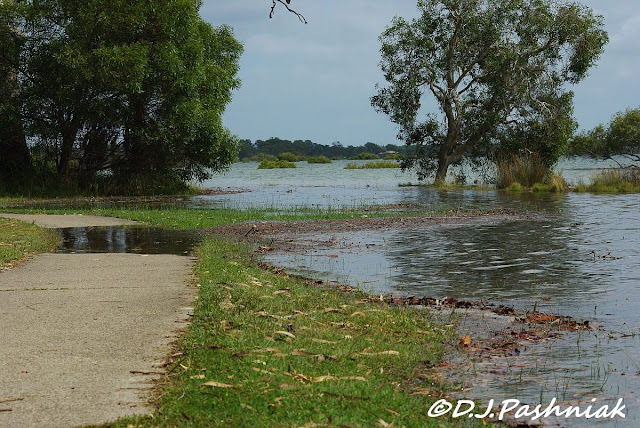 This photo was taken in 2010 when the tide height from the charts was 2.81 meters. This photo was taken this last week-end when the tide height was predicted to be 2.82 meters. 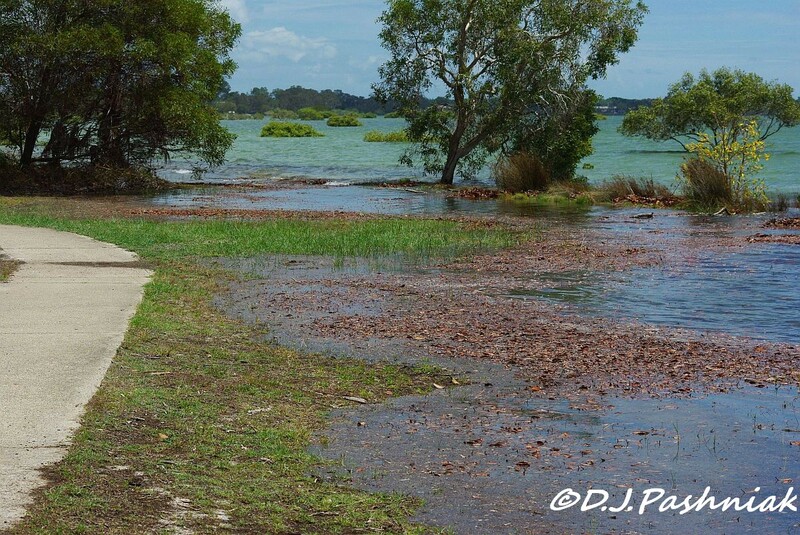 A wider view of the same piece of pathway shows where the water has risen over a little bit of the foreshore. "Variations in tidal heights are mainly caused by unusually high or low barometric pressure or by prolonged strong winds. Low-pressure systems tend to raise sea levels and high-pressure systems tend to lower them. The water does not, however, adjust itself immediately to a change of pressure. It responds, rather, to the average change in pressure over a considerable area." 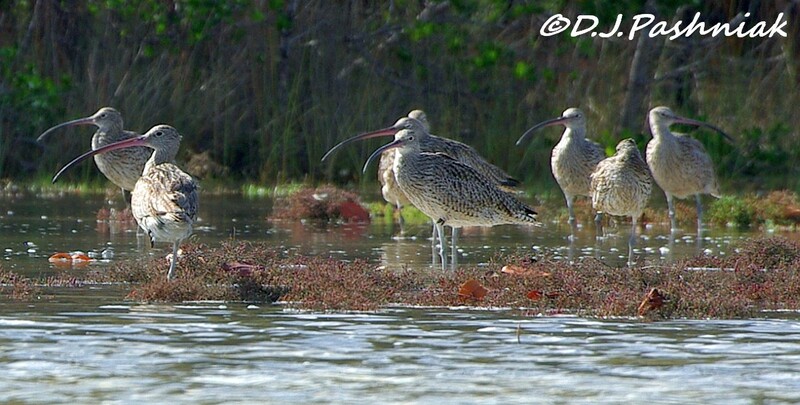 These photos of shorebirds were taken at the Crab Creek Roost around the high tide on Friday. 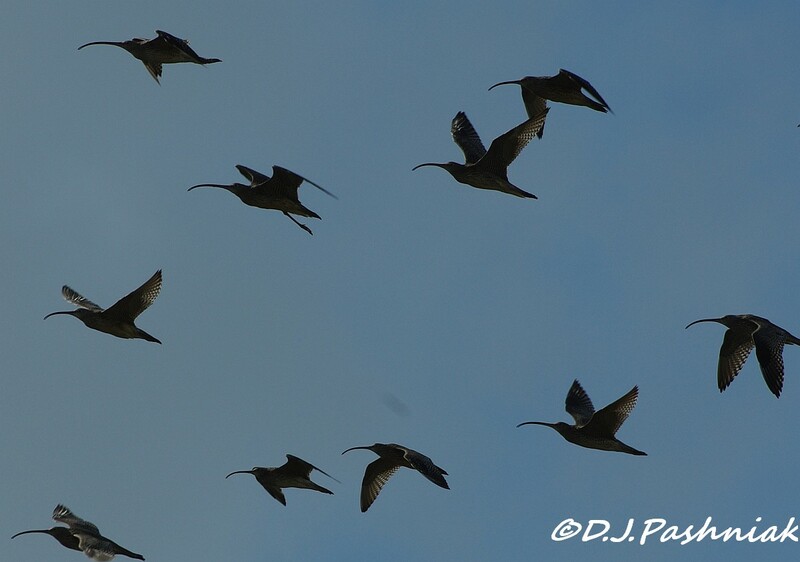 Only the bigger shorebirds were roosting as the sandbanks gradually went under water. 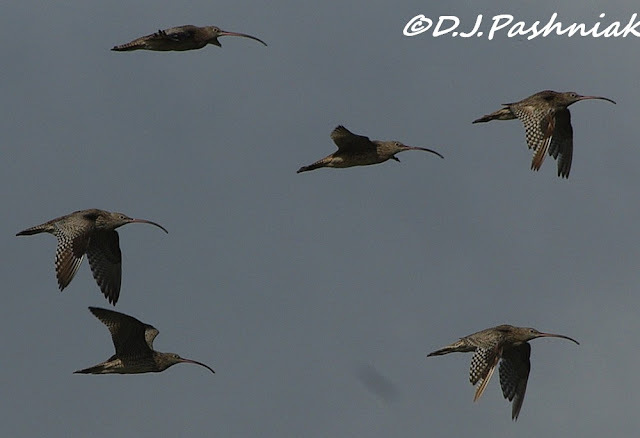 It was interesting to see so many Eastern Curlew roosting together, and beside Bar-tailed Godwits. Eastern Curlews are the largest migratory shorebird to come here. 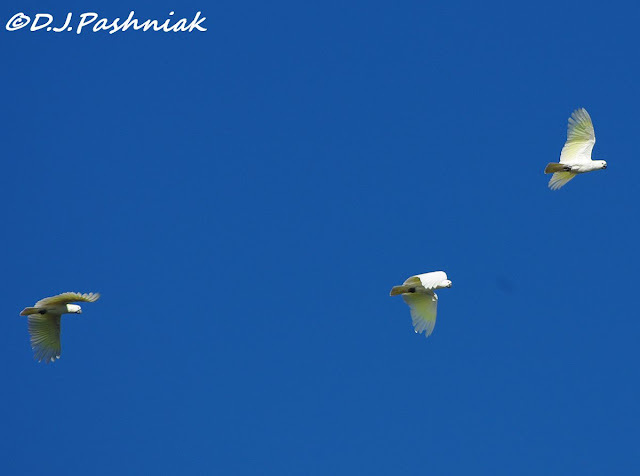 As the water rose the birds started disturbing, flying around overhead for a few moments, and then landing again only to find that the water was getting even higher. 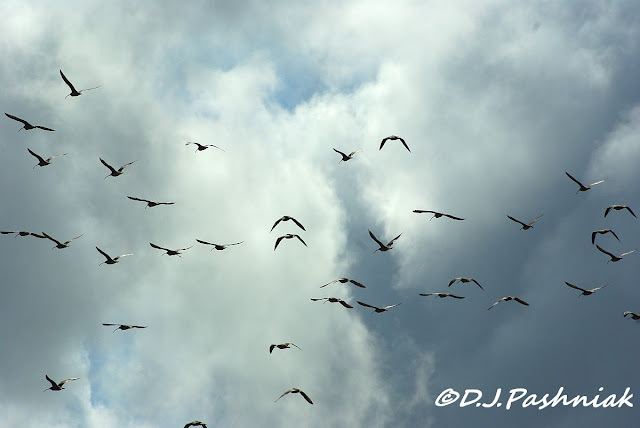 Eventually I watched large flocks flying off to the north-east. At times like this I wish I had the ability to take off with them and find out where they go. What a week it has been - and continues to be as well. The rest of the country has sweltered in unusual heat and strong to gale force winds and it is due to hit us today. The temperature is predicted to hit in the high 90's (F) 36 (C) which is unusual for here. The weather conditions have helped along some disastrous fires - especially in Tasmania, Victoria, and New South Wales. There has been property lost and there are still people unaccounted for especially down in Tasmania - but no confirmed deaths so far. Now, we wait and see what today brings! The other problem - certainly not important when compared with the tragedies of the fires - I lost internet connection for 4 or 5 days! How I have come to depend on net connection for immediate weather, news, and just plain connection to friends and family! I was changing my ISP to get better speed and lower cost - and it looks as if it is all going to be worth it! - but in the process I was switched off from one service before the other was available. It will be great to now be able to watch videos on many of the bird blogs without waiting several minutes for them to download! OK now for the birds. 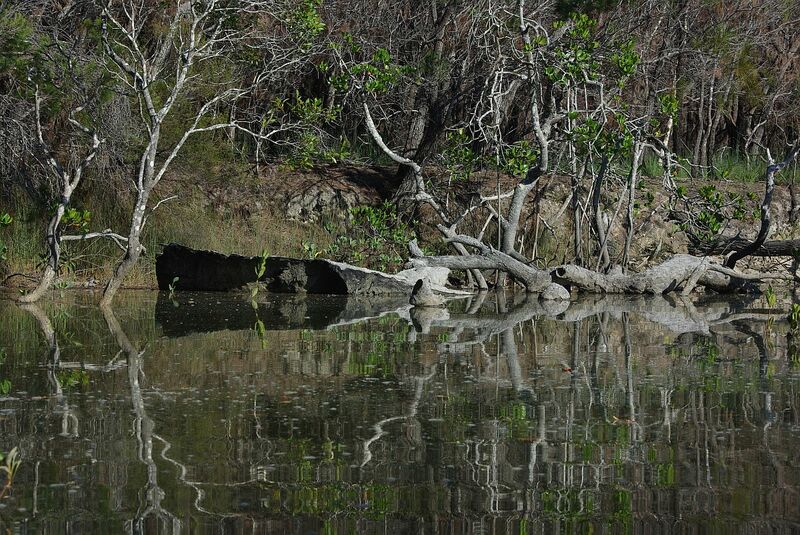 These photos were taken a few weeks ago on one of the very high tides when most of the Mullens roost was underwater. 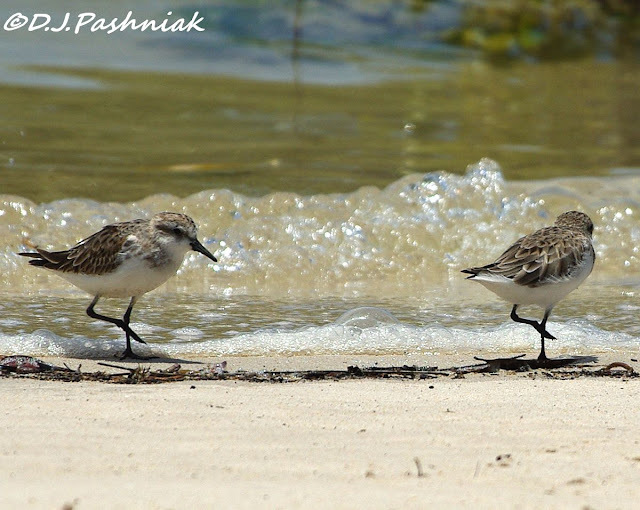 This one little sand bank stays out of the water and I have watched small shorebirds gather there over the past years. It's good to know they are still using it on very high tides. There is water on both sides of the sand bank and because the birds usually gather on one side it is possible to stand on the other side without disturbing them. They seem to feel secure enough to stay where they are without moving too much - possibly because they can only see my head and shoulders above the sand because I am standing in waist deep water on my side of the bank. 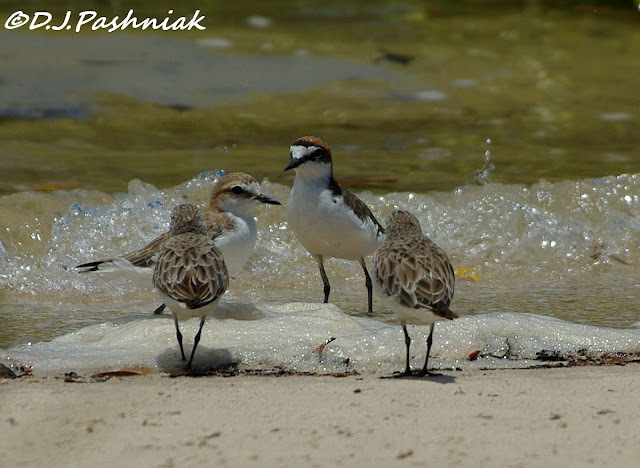 The other week there was a mixture of Red-capped Plovers (a resident shorebird) and Red-necked Stints (a migratory shorebird). 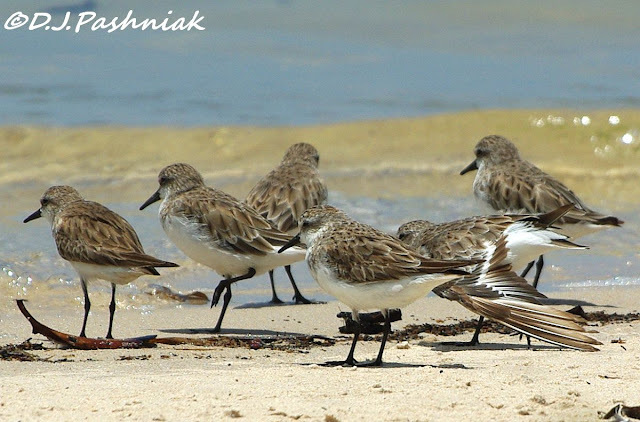 BTW the Stints only get their red necks when they put on breeding colors just before they migrate back to the northern hemisphere. They are the smallest shorebird to migrate here. 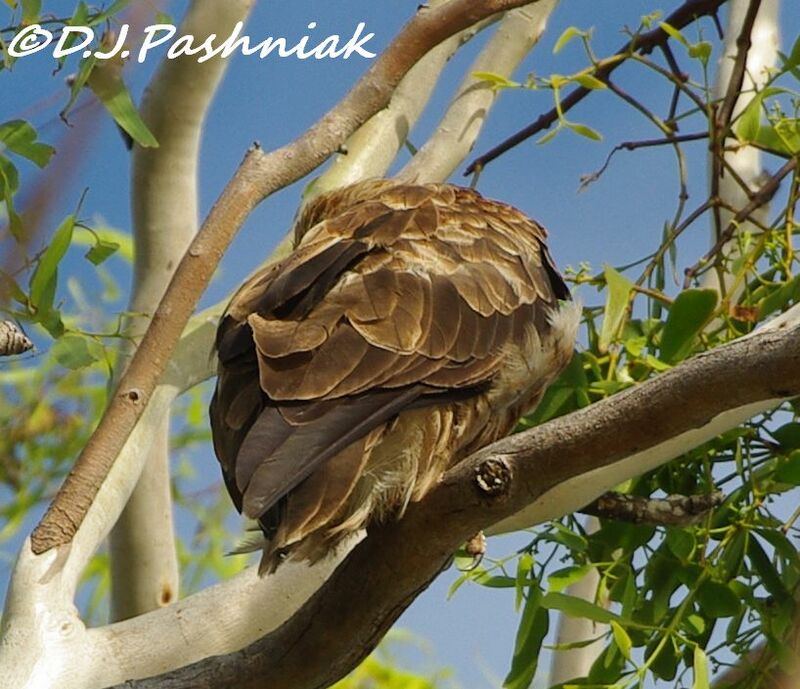 Both of these birds are tiny - about 150mm or 6 inches. The little ripples breaking against the sand looked like major waves behind the birds. One of the Stints stretched a wing and gave me a good look at the feather details. It's always nice when plans work out just as you want them to! Christmas day went just as we had planned. First we had an early morning kayak - then a delicious dinner with family and friends. 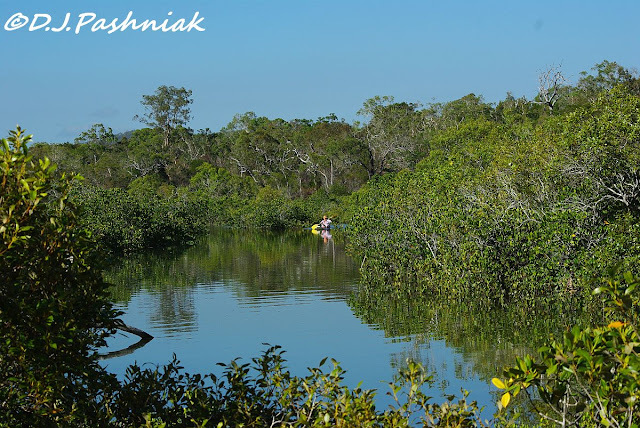 The tide was early with enough water over the flats to make it easy to kayak quite close to the shore. 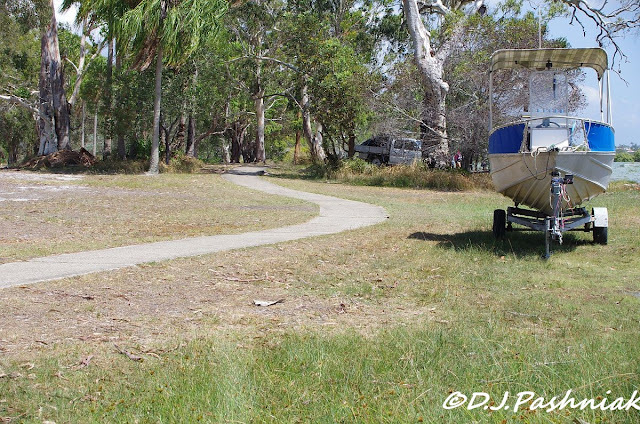 Even with all the tourists in the area there was no-one at all on the bay - a stretch of miles with only ourselves there! We decided to kayak to an area where we don't usually go. 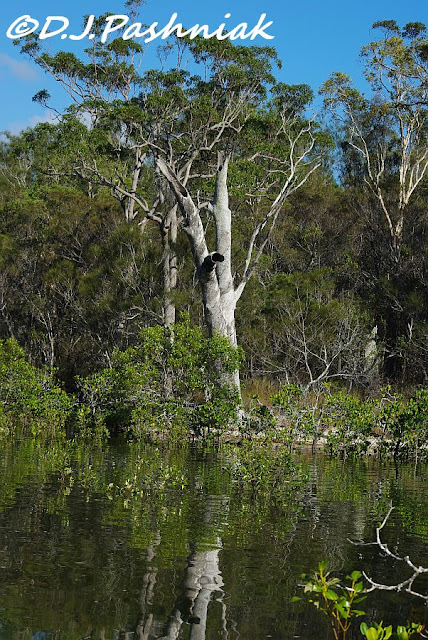 There are lots of creeks and inlets which make interesting kayaking - but the only ones I usually visit are the ones where there are shorebirds roosting. 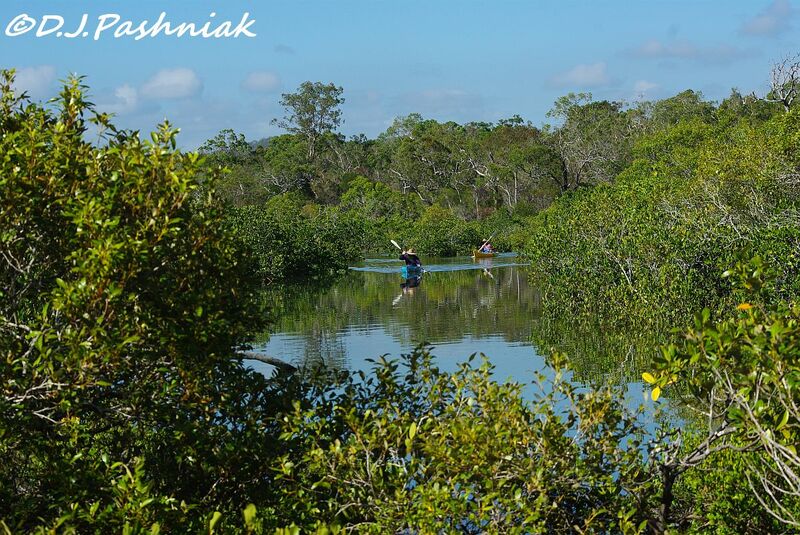 After kayaking along the bay for just about 1.7 kms (nearly 1 mile) we reached the creek we wanted to kayak into. It is surrounded by mangrove trees but the banks rise quite steeply in places and the forest comes down quite close. Even out on the bay there was almost no wind and in on the creek the reflections were great. 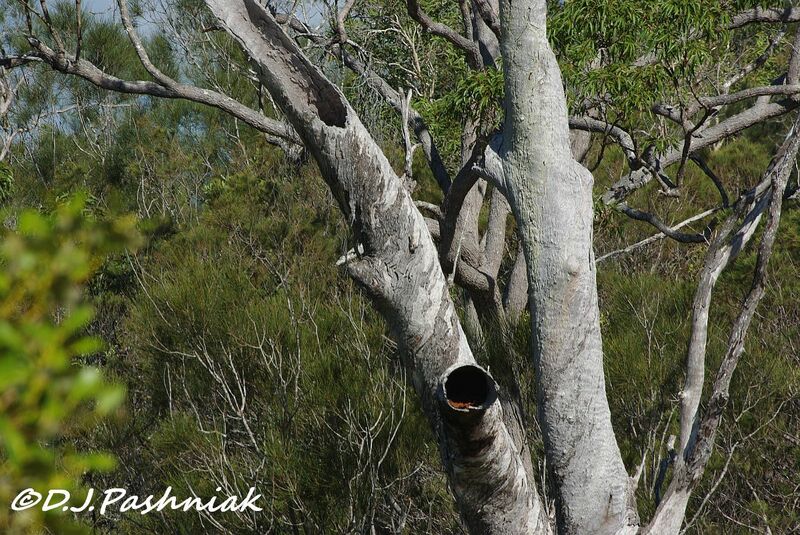 There were some tall eucalyptus trees and some of these were dead with lots of interesting holes - perfect places for nests for birds and some of the climbing forest creatures. In some places the trees had fallen and almost blocked the creek channel. 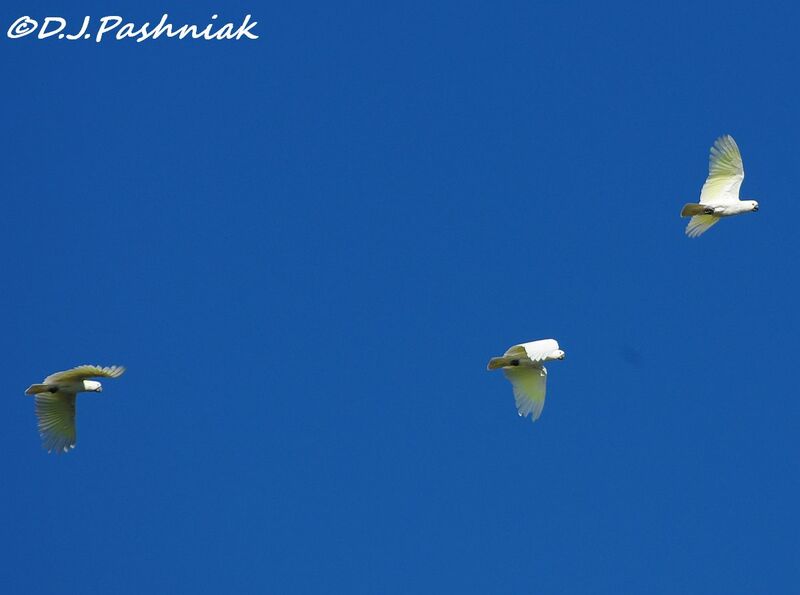 The only birds I managed to get photos of were these Sulphur-crested Cockatoos as they flew overhead. 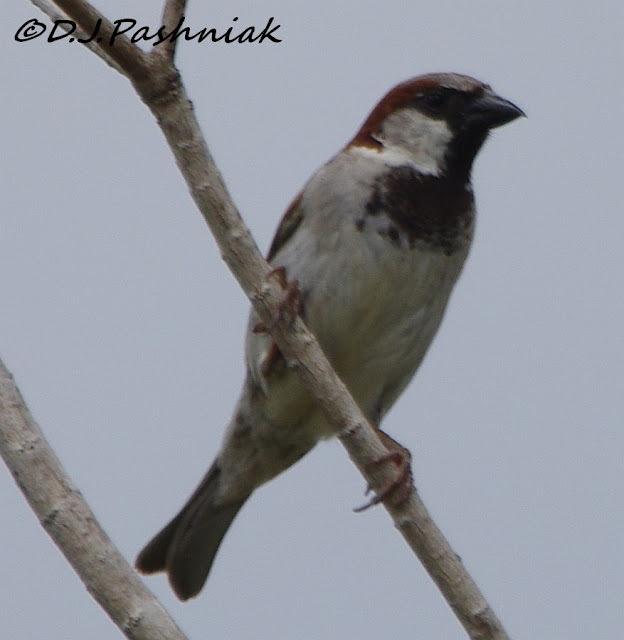 These birds are so noisy that you hear them coming! When I first came up here 9 years ago there were flocks of several hundred that flew over my house every morning. However, the big pine trees where they used to feed and roost have now been cut down and there are not so many seen right around town. Some of them still come into the pine trees in the empty block next to my house and sit up there and tear open the cones to get into the seeds.